September 19, 2011 ~ Minister Giuseppe Perrone and Minister Natalia Quintavalle have been appointed Consul Generals of Italy in San Francisco and New York respectively. Perrone was born in Taurianova, Reggio Calabria, on September 3, 1966. He is a Political Science graduate from the University of Torino. He entered the italian Diplomatic Corps in 1990. Prior to the appointment to San Francisco, he was the coordinator of the political office at the Italian Embassy in Washington, D.C.
Quintavalle was born in Pietrasanta, Lucca, She graduated in 1981 from the University of Pisa, and entered the Italian Diplomatic Corps in 1986. 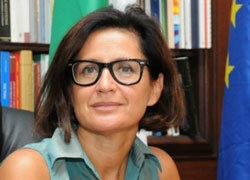 She previously worked in NY as the commercial counselor at the Italian Permanent Mission to the United Nations. Prior to her appointment to New York, she served as the Deputy Director-General for Political Affairs and Central Director for the United Nations and Human Rights.